'X-Men: Days of Future Past' ending: What it means. So what follows is not meant to nitpick the plot of Future Past. Rather, this is an inquisition, an attempt to seriously understand what the space-time continuum really looks like after it has been twisted into fifty pretzel-spirals of insanity. SPOILERS FROM HERE. PART ONE: WHAT THE HELL WAS HAPPENING IN THAT POST-CREDITS SEQUENCE? – Shots of the desert. – Shots of a strange, shadowy figure atop a dune. – The shadowy figure raising his arms — and assembling one of the Pyramids of Egypt in the span of a few seconds. – A close-up of that shadowy figure, who looked not quite human…and, in the distance behind him, four out-of-focus people on horseback. We already know that 2016’s X-Men sequel will be called X-Men: Apocalypse. 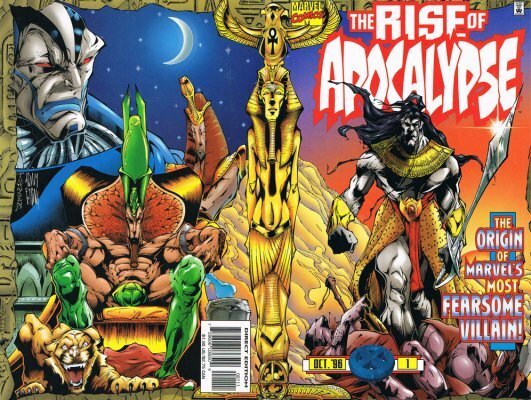 In the comic books, Apocalypse is one of the most powerful and terrifying villains to torment the mutant superteam. Even though he looks like a little bit like a cyborg battletoad, Apocalypse is actually the world’s oldest mutant. And I mean old: As established in the mid-90s origin story The Rise of Apocalypse, he was born in Ancient Egypt over five millenia ago. Thanks to his grey skin and the weird blue lines across his face, Baby Apocalypse was abandoned by his family — but a band of nomads found him and raised him. Recognizing his grand destiny, they named him “En Sabah Nur,” which means “The First One” in Ancient Comic Book Language.En Sabah Nur had a rise to power worthy of Conan the Barbarian, becoming a conqueror and a king. Along the way, he frequently recruits powerful mutants to serve as one of his Four Horsemen, his soldiers/acolytes/backup singers. During his mid-’80s first appearance, he actually recruited an X-Man, transforming the lovable and boring Angel into the terrifying and awesome Archangel. Since Angel isn’t a big part of the big-screen X-Men franchise, it seems likely that Movie-Apocalypse will recruit a different X-person to his cause. Will it be Magneto? Or — as part of the franchise’s ongoing effort to assure Jennifer Lawrence that she is playing a really important character — will it be Mystique? PART TWO: WHAT THE HELL HAS HAPPENED TO THE SPACE-TIME CONTINUUM? Fortunately for the X-Men, they have Rachel Summers, daughter of Cyclops and Jean Grey. Like her mother, Rachel’s a mega-powerful telepath. So she sends beloved X-gal Kitty Pryde back in time to 1980 — “the present day” when the story first appeared. (This is the Brain Method of time travel — Future Kitty possesses her past self, a la Desmond in Lost.) Kitty works with the present-day X-Men. They stop Mystique; Future Kitty’s consciousness disappears. It’s never clear if the X-Men actually prevented the dark future, or just forestalled it; in fact, the original “Future Past” arc ended with the now-alive Senator Kelly restarting the Sentinel program, convinced more than ever that mutants were dangerous. So Wolverine and Professor X travel to Washington DC, to stop Mystique from assassinating Trask again. Problem: Young Magneto also wants to assassinate someone. But he’s setting his sights higher: He wants to kill the President. Presumably, this turns Timeline B into the darkest of all possible timelines: A mutant assassinates the President, the American public goes into paranoid freefall, and mutants spend the next five decades hunted by Sentinels. But this doesn’t happen. Again, it all comes back to Mystique. First, she impersonates the President and shoots Magneto — in front of the cameras, providing the people of the world with an image of a mutant saving the President. Once again, she holds a gun on Trask. And this time, she doesn’t kill him. We are meant to understand that this changes everything. In the dark future, we see the Professor and Future Wolverine and Kitty Pryde attacked by a Sentinel — and then suddenly, they disappear. Back in the past, the various First Class people go their separate ways: Magneto presumably leaves to assemble a gang of Mutant rebels, Mystique leaves for parts unknown, Professor X and Beast probably go back to the X-mansion to start teaching little mutant kids. Poor Wolverine is at the bottom of the Potomac, but he’s Wolverine, so he’ll be okay. Future Past could end there…but it doesn’t. Instead, we see Wolverine wake up. This is Future Wolverine: We can tell, because he has the white streaks in his hair, and because the radio in the corner of his room has a groovy future hologram. He is inside of the X-mansion. He sees Storm, Beast, Iceman, Rogue, Colossus, Kitty Pryde. So far, we appear to be in a time after X-Men: The Last Stand — a future where all the X-people who were still alive at the end of the original X-trilogy are now teachers at Xavier’s. And then Wolverine sees Jean Grey, who died in X-Men: The Last Stand and whose phantom tortured him in The Wolverine. She looks happy to see him. Wolverine touches her…and then CYCLOPS APPEARS. CYCLOPS! CYCLOPS! CYCLOPS! MARSDEN! CYCLOPS! What do we know for sure has changed in the past? Mystique did not kill Trask, which means that she has not become the coldhearted assassin played by Rebecca Romijn in the original trilogy. Or anyhow, she hasn’t become that person yet: The fact that she’s not there at Xavier’s in the future could imply that she’s just a different kind of villain. (Also notable: Future Magneto isn’t mentioned in the Bright Future, which means he’s probably still an antagonist for the X-Men.) It seems likely that, if Mystique appears in Apocalypse, she will be a force somewhere between Magneto and Professor X: A lone wolf with her own agenda. But we leave her with Wolverine — and here’s where things get hazy. In X-Men Origins: Wolverine, Logan meets William Stryker sometime in the early ’70s, in Vietnam. Six years later, Logan goes to Stryker on a mission of vengeance, and joins the Weapon X program, getting adamantium grafted onto his bones and claws. Yadda yadda yadda, he gets amnesia, and wanders the earth until X-Men 1. Now, Future Past basically ignores everything about X-MO:W, much like everyone else on the face of the planet. In Origins, Stryker is played by 47-year-old Danny Huston; in Future Past, he’s 28-year-old Josh Helman. But Future Past does explicitly reference Brian Cox-as-Stryker in X2. So Future Past clearly establishes that — at some point in the original timeline — Wolverine met William Stryker, and Stryker gave him adamantium and amnesia. In the original timeline, Wolverine definitely did not meet Stryker after being fished out of the Potomac; and when he met Stryker, Stryker definitely was not Mystique. This could imply that Past Wolverine will now receive his adamantium much earlier — and, when he does receive it, he could wind up working directly for Mystique. Remember: Past Wolverine doesn’t care about the X-Men, which means a bizarre situation could develop where Past Wolverine becomes more of an antihero/villainous figure while Future Wolverine remains a heroic leading member of the X-Men. This utterly confusing situation is actually completely in keeping with the original iteration of Wolverine, who was presented as a pretty not-great guy with a murky past who joins the side of the angels just because. So X-Men Origins: Wolverine didn’t happen? But what about The Wolverine? I liked The Wolverine! Me too. But the central emotional arc of The Wolverine depends on Logan mourning his actions in X-Men: The Last Stand — and specifically, mourning the death of Jean Grey. Also, The Wolverine ends with Logan meeting Professor X and Magneto, who ask for his help — and although it’s not explicitly stated what that help is, a commercial for Trask playing in the background makes it pretty explicit that that’s where Logan joins up with the Future X-Men. Now, it’s worth pointing out that just because Jean Grey is alive in Bright Future C doesn’t mean that she never died. The character has been resurrected so many times in comic book form. It’s entirely possible that Professor X’s 50-year recap included this explanation: “So, yes, me and Jean and Cyclops did still die in X-Men: The Last Stand. But I beamed my brain into a lookalike body, and Jean came back to life because of her Phoenix power, and we worked together to bring Scott back to life, too.” But again, this will never happen, because everyone just wants to forget The Last Stand. What does this mean for the 2017 Wolverine threequel? Unclear. The epilogue of The Wolverine explicitly took place two years after the rest of the movie — and before that epilogue, Wolverine set off with his new pal Yukio, presumably to walk the earth like Caine in Kung Fu. The next Wolverine could take place during that two-year period. Or it could pick up with Wolverine in the new timeline and just pretend that everything in The Wolverine happened, besides those nightmares about Dead Jean Grey. Or it could take place anytime in the half-century between 1973 and Future Past. Frankly, the latter option sounds like the best idea: Imagine a story about Wolverine in, like, gritty ’80s New York; or imagine if, in this new timeline, Wolverine spent the early 2000s running antiterrorist operations. Just spitballin’. At the end of The Wolverine, Logan has bone claws. In the dark future of Future Past, he has adamantium claws. Um, maybe Magneto gave him adamantium claws? Like, he just had some adamantium lying around? Does Bright Future Wolverine have adamantium claws? We don’t know. But probably. Because they’re awesome. Since he’s been in two movies now, are we ever going to learn if Alex Summers is supposed to be Cyclops’ father or brother, or is he just an unrelated guy with the same name and vaguely similar powers? Aw man, I love Havok. But I dunno. At the end of X-Men: The Last Stand, Professor X’s body has been exploded, but his brain has jumped into the body of a brain-dead comatose man. In Days of Future Past‘s dark future, Professor X is alive and in his own body. How is this possible? Maybe he’s actually in the brain-dead guy’s body, but he’s projecting an image of himself into everyone’s head, so it’s less confusing? But then why would he still be in a wheelchair? What does this ending mean for X-Men: Apocalypse? Bryan Singer told EW’s Tim Stack that the next movie will be set in the 1980s. Presumably, after the events of Future Past, Professor X and Beast will begin building up a new team of X-Men. This team will probably include lots of new faces, because crazy as it sounds, there are still mutants that have not appeared in these movies. So Quicksilver is probably-definitely coming back, and Psylocke is maybe-possibly going to join, and Marrow is sadly-unfortunately probably not. But Singer also established that he wants to bring in “familiar characters at different ages.” Because the original X-trilogy has now been tweaked, that means that anyone is on the table. Singer himself has noted that he wants to bring in a younger version of Nightcrawler and Gambit — with a Channing Tatum-Gambit spinoff supposedly in the works for later this decade. So there is hope for Lupita Nyong’o as Young Storm, guys! More importantly, the “familiar characters” thing could imply that we’ll eventually see Young Jean Grey — which could in turn mean that X-Men: The Dark Phoenix Saga could become an actual movie, and not a subplot inside of another movie. Actually, it’s worth pointing out that — although Future Past itself is carefully manicured to provide space for all ages of X-Men — the ending of Future Past doesn’t obviously lead into any new story. Life, if Jennifer Lawrence doesn’t want to come back, Mystique could disappear; if Apocalypse doesn’t have room for two bad guys, Magneto doesn’t need to appear; conversely, if they want to do a Magneto or a Mystique solo film, both characters are in the right place. Heck, if they wanted to, they could even come back around and do X-Men 4 and X-Men 5 with the original cast, something that longtime X-producer Lauren Shuler Donner promised three years ago, back in the bygone era when planning multiple franchise spinoffs half a decade in advance was madness and not the status quo. But if Future Wolverine from the original Dark Future wakes up in the head of Future Wolverine from the Bright Future, doesn’t that mean that there is a separate Wolverine Consciousness who suddenly gets wiped out of existence when the Original Wolverine Consciousness comes back to the Bright Future? But if in the original timeline Mystique was captured by Trask’s people, why didn’t she spend the original trilogy trying to get back at the people who experimented on her? And in the original timeline, how did Magneto escape from his Pentagon prison? And in the original timeline, did Professor X spend several more years bummed out on spine-growing power-ruining mutant heroin? Now that everyone knows that Mystique has magic blood, doesn’t her mere continued existence mean that some mad scientist somewhere and sometime could make the Dark Future happen? Since Wolverine has spent at least a decade mourning the death of Jean Grey, won’t it be weird for him to see her alive again but with another man? Does Rogue still have her powers, or did she still get the mutant cure? Since Young Professor X read Wolverine’s mind and saw the events of the future, including the lives of his students, doesn’t this make him a terrifying puppet-master time lord who can never tell the people he loves that he knows all about them and has spent his life trying to prevent their dark future? Hey, but, like, Blink was really cool! What does the cancellation of 'Eureka' mean for SyFy's future? Will the 'Fantastic Four' reboot cross over with the 'X-Men' franchise?